Use this form to "phase place" each patient, having them compare their X-rays with the examples printed here. 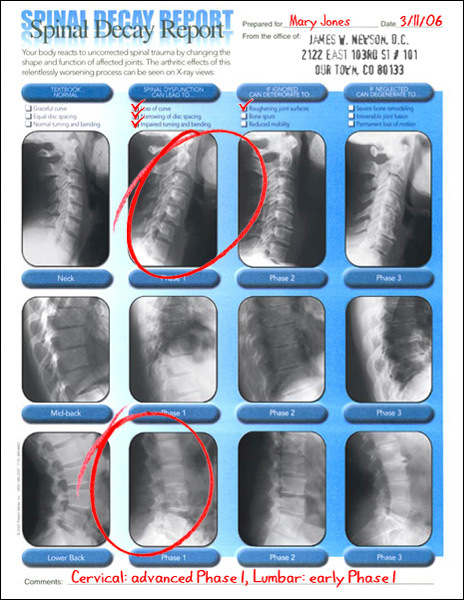 It's a powerful way to send patients home with examples of their X-rays. Most patients think their problem started "yesterday when they bent over." Set the record straight by having them “phase-place” themselves at your report. Use this powerful question to involve the patient and set the stage for your radiographic explanations. With a red pen, check the boxes that describe the views you’ve taken. Circle the examples that most closely match theirs. Identify the bone spurs, disc narrowing or loss of curve that match the patient’s X-rays. It might look something like this image to the right when completed. In less than a minute you’ve made your point without unnecessary and time-consuming detail. Send them home with the ammunition they need to justify your recommendations to a spouse or loved one. Choose left- or right-facing (as shown above) to match your X-ray technique. The Spinal Decay phase degeneration sheet coordinates with our Spinal Decay chart. Still using the term subluxation degeneration that patients associate with the aging process? Time to simplify!